After thoroughly enjoying this plate, (and with the relief of a third reviewer coming to join), we decided to throw our hats into the ring for round #2: Steak and chili. Appearance: (9)Cheesy deliciousness all over the place, with barely a chip or topping poking through. A massive glop of guacamole and the black olives added a nice touch of color to the first plate. Like a cool pool on a hot summer day, we wanted to dive right in. Quality of Ingredients: (9) Almost all of the toppings were very high quality. Both the steak and the chicken were tender, moist and deliciously seasoned. The refried beans and chili could have definitely held their own as the central ingredient of the nacho plate. The cheese stayed melty and inviting until the very end. Even the guac, though clearly not homemade, was fresh and zesty. The chips were the biggest downfall: A bit too dense, and lacking in full-bodied flavor. Distribution of Toppings: (7) The sheer volume of cheese covering both plates of nachos made a low distribution score nigh impossible. Still, there was little effort put into layering: it was just chips under toppings under cheese. Whether through foresight or stinginess, these nachos were relatively flat, making multiple layers welcome but not essential. 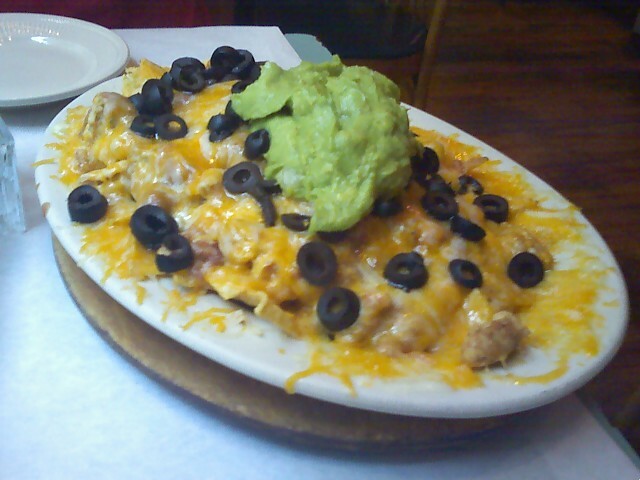 Price: (8) Chips and cheese started at $3.10, with each topping incurring an additional cost. These, for the most part, were pretty reasonably priced, and while we don’t remember exactly how much each plate cost, the total for two not-insignificant plates of nachos and a liter of sangria came to $30. Amen to that! Overall: 33/40. Aside from being delicious, these nachos got us thinking, about choice, free will, and their effect on both the human condition and on nachos. 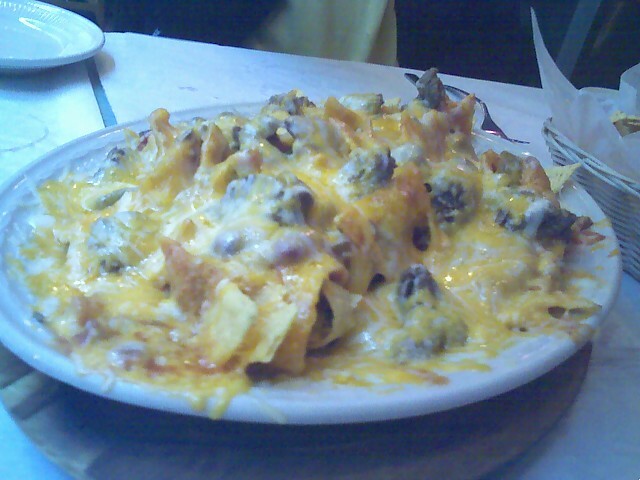 Never, aside from our own attempts at nacho construction, have we had such free reign over the content of our nachos. It is illuminating to have all of one’s choices presented in bullet points with relative prices attached; it makes one realize just what is important in nachos. While we enjoy tomatoes, we decided to skip them and the corresponding additional $0.95 in lieu of other things. The same went for sour cream, jalapenos, etc. Were these nachos better off for that? It is difficult to say. Non-essential does not imply non-beneficial; while we may not particularly enjoy many of the things on our nachos, sometimes it takes their absence to really appreciate them. These nachos were a wonderful, worthwhile, memorable event; but they did remind us that often, in nachos as in life, it is not reaching the ultimate goal so much as the details of the journey that make it so grand. Tags: cheap, choose your own adventure, Downtown Boston, Sangria, Tex Mex, Theory of Nachos, Viva Mexico! Wow! I haven’t been to Fajitas and Ritas in years. Thank you for reminding me. I used to go a few times a year when I worked downtown. Great place of a group lunch. They look like decent nachos but with WAY too much stuff on them. It must have been napkin city. Thank you for the well-written, humorous, thoughtful and even thought provoking review of our nachos. And thanks for coming in and being a customer.